As Francis Ford Coppola's The Godfather, arguably the greatest movie ever, celebrates its 39th anniversary this month, its impact can be felt in almost every crime drama made thereafter. The Godfather, since its release in March 1972, has slipped into popular culture exerting the sort of influence very few films can claim to. Naturally, such a colossal movie has inspired remakes in every region. Bollywood has had its share of The Godfather moments but it has only managed to scratch the surface. Like a master poet's work, the nuances, complexities and subtexts of such cinematic masterpieces are often missed on a single viewing. We take a look at some of the desi takes on The Godfather. Ram Gopal Varma's very own tribute sees Amitabh Bachchan step into a character based on Marlon Brando's Oscar-winning Don Vito Corleone (Kay Kay Menon re-enacts Santino and Abhishek Bachchan plays Michael). RGV changed the set-up from mafia to Marathi politics, claiming that Sarkar is more Shiv Sena leader Bal Thackeray than Corleone. Our take? He turned out to be a bit of both. Of course, RGV reprised the cult scene from the original in which Don Vito tut-tuts the drug deal. 'But drugs is a dirty business,' the Don tells Sollozzo, displaying a rare sense of morality in an immoral business. Watch Sarkar again and it'll be hard for you to miss it when the Big B's Nagre is met with a similar offer, to which he quips, "Main bhi nahin karunga aur tujhe bhi nahin karne doonga." Look at those indoor scenes between Jackie Shroff and Nana Patekar and you'll detect The Godfather influence. What makes us compare the two films -- logically, not so much as compare than point out inspirations Parinda sought from the classic -- is the mechanics of the mafia, the scope of its activities and the interplay of characters. 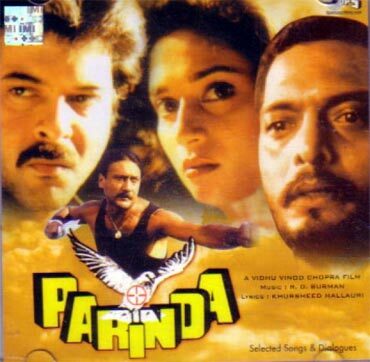 However, director Vidhu Vinod Chopra gives his Anna (Nana Patekar) a different dimension. Anna is portrayed as irascible in sharp contrast to the impressively composed Don Vito, who commands respect by merely looking into your eye, making you believe that he can be far more menacing than he permits himself to be. Serendipitously, many years later, for his first Hollywood film Broken Horses, Chopra would go on to hire the executive producer who worked on the film that inspired him. The cowboy wasn't a coy-boy when it came to unofficially attempting to re-tell The Godfather in an Indian setting. 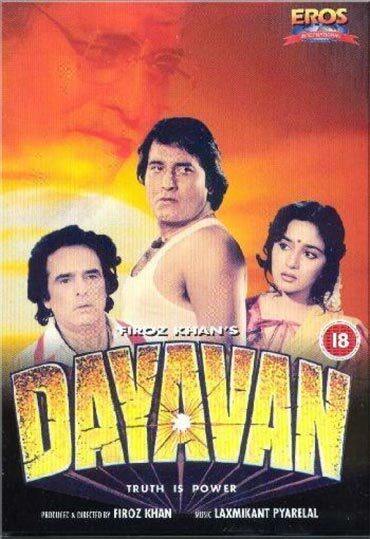 Yep, it took the audacious Feroz Khan to turn in as a director-actor on the ambitious attempt. As is the case with several films which look Westwards for that magical flash of inspiration, Dharmatma, having found its base in the crime classic, localised the narrative by drawing from the life of 1970s gambling ace Ratan Khatri. 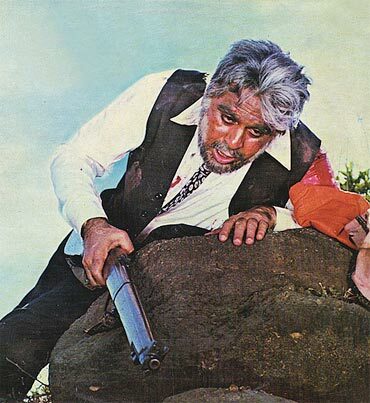 As if that wasn't enough, Feroz Khan took the shooting to Afghanistan, making it one of the earliest films to use the Afghani terrain as backdrop. 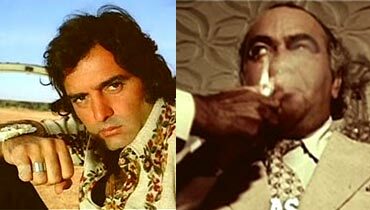 The relationship between Feroz and Prem Nath, who plays the title role, can be viewed as parallel to the one between Don Vito and his son Michael -- not Sonny because Feroz's Ranbir is a man of principle. While it did not match up to the original, it did announce the arrival of another Khan. We can't blame Feroz Khan for his obsession with The Godfather, can we? 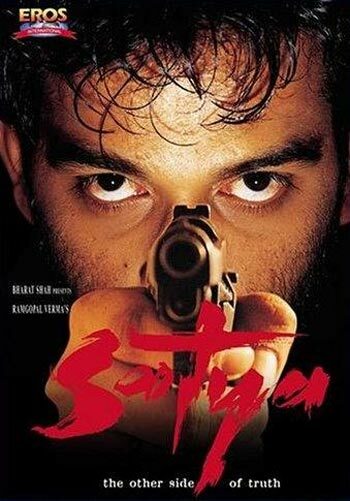 Officially, even though Dayavan is remake of the Tamil crime drama Nayagan, in spirit it has much to owe to the Coppola classic. That's because Kamal Haasan's Nayagan has many characteristics of The Godfather. Nayagan begins by tracing the life of the real-life gangster Varadarajan Mudaliar and it's very honest in its character study. However, as one gets immersed, it's tough to miss The Godfather references which are all-too visible -- Velu's intensity, his Vito-like morality in his actions, his adopted son (who eventually shoots him) and yep, the status of a godfather amongst his followers. Dayavan picks the same path but honestly, Mani Ratnam's Nayagan remains a notch above. 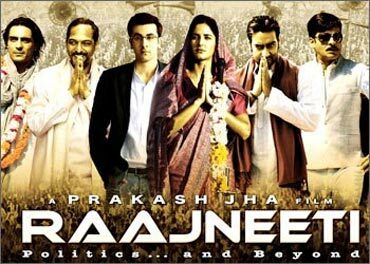 Prakash Jha's Godfather-meets-Mahabharata movie echoes the Indian state of affairs, its identity politics and the leftist ideology, amongst others. The power struggle and a strong dynastic politics remind one more of The Godfather than Indian mythology. It has more of the characters modelled on the Corleones than the plot, which as Jha painfully explained, is to be seen as an allegory on Mahabharata. So Arjun Rampal is a take-off on Sonny Corleone -- he plays Prithviraj Pratap, who's hot-headed and impulsive and of course, has a voracious sexual appetite (refer to the charged-up scene with the party worker played Shruti Seth?). Most of all, one can glimpse Michael Corleone (and Rajiv Gandhi) in Ranbir Kapoor, who returns from abroad to take over the affairs. One of Bollywood's best gangster movies yet, Ram Gopal Varma's stunning portrayal of Mumbai's underworld remains a career-high for him. Mostly, the 1998 film is Godfather-esque in the way it mixes cinema and crime. And the deeper nuances that go far beyond that. On the surface, its various characters, the lackeys who dot the Satya landscape and the scare-the-music-director scene look as if RGV's intention is to give a clean tribute to The Godfather. But what most people miss about Satya is that it's an allegory on Mumbai itself. Ironically, most don't see The Godfather in the way it was originally intended to. The film is survives the test of time because of its lasting quality because it offers something deeper and more meaningful than we assumed it to possess. Coppola makes a statement on the corruption of a nation's original values and ideals. Home after serving in the military, Michael, in that sense, represents those values and ideals and one who's forced into a life of crime. It's a bitter commentary on the American way of life, its capitalistic beliefs, the migrants who make up the land and the families that form the crime courtyards. Satya, who comes to work in Mumbai, can be seen in that light. Possibly a female version of Corleone, the feisty Rambhi spares none in her fight against the political system. When her husband, a mafia kingpin, is killed by the politicians who stage-manage him, she decides domesticity is not enough and takes up the gun. 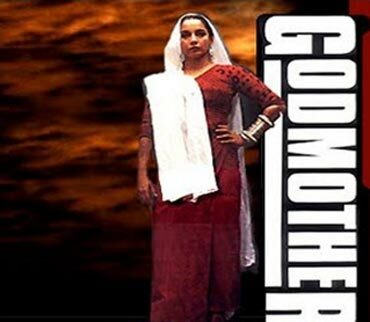 A symbolic while shawl around her head, Rambhi assumes the role of the Godmother, controlling the gang with an iron-fist -- imitating the traits patented by Don Vito. Shabana Azmi who plays the title role, is menacing and humane at once. As the widow of the local mafia don, Rambhi inherits the mannerisms. But the aggression is certainly her own. Ajay Devgn's smashing debut, Phool Aur Kaante has all the trademark of a good Bollywood potboiler. It had the The Godfather touch as well. Amrish Puri's character Don Nageshwar is clearly a rip-off on the original Don -- though not as memorable as we'd like. Nageshwar runs the underground mafia activities and his only son, played by Devgn, is unaware of it. While Nageshwar looks at his son to take over the reins, he wishes to remain away -- much like Michael -- from the world of crime. Dilip Kumar's Shobraj in 1982's Vidhaata is another Don Vito me-too. However, it goes without saying that Dilip Kumar, as the chief of the Mizya group, gives immense respectability to the character. In any other hands, it would have looked only infantile in comparison to Don Vito's classic appeal.